This is a story about politics and power in the golden land, and it begins with the money. In early May a luxury resort in Laguna Beach, Calif., hosted a five-day semi-annual meeting of the Democracy Alliance, a secret, invitation-only organization of liberal moneybags that since its formation in 2005 has directed some $500 million in contributions to progressive groups. Never has a wolves’ den been so posh. The Alliance discloses neither its members nor its beneficiaries, but some of the details of its structure have leaked out over time. The Los Angeles Times, which was granted exclusive access to the Laguna retreat, reports that Chris Hughes, the Facebook millionaire who owns a failing lifestyle magazine, has joined the ranks of the Alliance, which has "roughly 100 members, who pay annual dues of $30,000," and who "are required to contribute at least $200,000 to organizations in the group’s portfolio." Currency speculator George Soros is perhaps the most famous member of the Alliance. Together, he and his friends have sponsored behemoths such as the Center for American Progress and Media Matters for America, as well as small fry such as Organizing for Action (OFA), the advocacy group affiliated with the White House that so far has failed to meet its fundraising goals or secure a single political victory. Jon Carson, the Obama stooge who runs OFA, pitched the likes of Hughes and Soros at the retreat, as did California’s governor and lieutenant governor. Robert Reich was there too. One would be hard pressed to think of a more appropriate setting than the Golden State for this confluence of rich Democrats and the hacks they employ. After years of playing second fiddle to the South and its ornery Republicans, California and its Democrats have recaptured their position in the first chair. More than the beautiful weather, the ecological diversity, and the dream factories in Los Angeles, California ought to have a reputation as the financial and ideological epicenter of Barack Obama’s America. California supplies not only vast amounts of capital to the Democratic Party and its infrastructure, but supplies also the spiritual inspiration for the policies those Democrats seek to impose on the rest of America. The state represents a possible future for the entire nation, and the preferred future of the American left: environmentally stringent, demographically heterogeneous, Pacific-oriented, inequality-obsessed (and inequality-prone), and devoid of conservatives in positions of influence. Saddled in recent years with high unemployment, high taxes, high government expenditures, and a hefty deficit, California’s economy nonetheless has generated considerable money for President Obama. More of Obama’s 2012 campaign haul came from California than from any other state, contributions from the Los Angeles-Long Beach metro area were behind only those from Washington, D.C., and New York City, and the president has drawn ideas and resources and personnel from Hollywood and Silicon Valley. Best of all for Obama, his relationship to the entertainment and tech industries has undergone hardly any of the scrutiny to which he would be subjected if he were a Republican drawing funds from Wall Street, oil, and gas. In the imaginations of American journalists, so many of whom live on the comparatively dull, and alternately humid and frigid, East Coast, California occupies a special place, a picturesque landscape full of beautiful people who profit from make-believe. 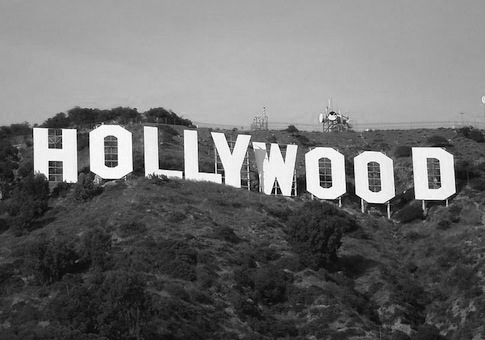 Hollywood wealth in particular enjoys immunity from criticism or skeptical inquiry. No wonder why: What every blogger really wants to do is direct. The hypnotic allure of celebrity is everywhere present in Andy Kroll’s Mother Jones profile of Jeffrey Katzenberg, the Hollywood mogul who in 2012 donated or raised more than $30 million for Obama. Fade in on a dinner table at Scarpetta, a shi shi restaurant in Beverly Hills, where Katzenberg, Bill Burton, Sean Sweeney, Paul Begala, and Geoff Garin are dining on Saffron Stracci, Fennel Dusted Black Cod, Colorado Lamb Rack, and Kale and Ricotta Ravioli. It’s March 2011. The Obama lieutenants are there to convince Katzenberg, "who is worth an estimated $800 million," to contribute to Priorities USA Action, the pro-Obama Super PAC that can raise unlimited amounts of money. Begala says a few lines of dialogue concerning the plagues that will befall the land if Mitt Romney becomes president. Katzenberg, wearing "a V-neck sweater over a T-shirt, slacks, and sneakers—his Hollywood CEO uniform," barks: "I know all that." What he doesn’t know is the business plan. Long story short, Katzenberg "liked what he heard." This opponent of unregulated political giving put his qualms aside long enough to donate $2 million toward the production of ads accusing Mitt Romney of causing a woman’s death from cancer. All told, he donated $3.15 million to Democratic Super PACs. "Begala," Kroll writes, had found his bell cow," which he could milk for funds. And what a cow! "At 60, Katzenberg, who stands 5-foot-5, cut a lean and fit figure (‘On background, he’s incredibly buff,’ says a friend of his), his clean-shaven face taut and tanned, with a disarming, horsey smile." Most of that sentence reads as though the DreamWorks publicity department had dictated it, but "horsey"? There goes Kroll’s job as a production assistant on The Croods 2. Katzenberg is a fascinating subject. A onetime aide to Mayor John Lindsay, the liberal Republican who did so much to make NYC ungovernable in the 1960s, young Squirt played his connections into a job as Barry Diller’s assistant, then as Michael Eisner’s number two at Disney, then as business partner with Steven Spielberg and David Geffen, then most recently as the head of a successful animation studio. Kroll tells this story well, but a little too well. The piece seems like the rough draft of a proposal for Katzenberg: The Authorized Biography. I can’t be the only person who laughed when I read that "Obama officials say they respect Katzenberg not only for his fundraising, but also because he has no specific ‘ask’—no ambassadorship to Switzerland, no regulatory tweak, no nights in the Lincoln Bedroom," and laughed again when I read that "Katzenberg has said he wants nothing, personally or professionally, in exchange for his support of the president." What makes the joke especially sweet is that the sentences that follow describe not one but two things Katzenberg has received "for his support of the president": A $430 million tax break for Hollywood studios as part of the fiscal cliff deal, and White House support for a distribution deal with China that would open the dictatorship to additional Hollywood blockbusters. When soon-to-be Chinese leader Xi Jinping visited Washington, D.C., in 2012, Kroll writes, Katzenberg "scored a seat next to Xi at a State Department luncheon." Lucky guy. Surely that $30 million the bell cow had produced had nothing to do with it. On his return trip Xi stopped in Los Angeles, where he and Biden lunched with Gov. Jerry Brown and, guess who happened to be in the neighborhood, Jeffrey Katzenberg. Together they came to a trade agreement from which Katzenberg will earn more money to pour into Democratic campaigns. Not only that, but Xi also personally endorsed his new buddy’s $350 million plan to open an animation studio in Shanghai, where Chinese workers will be paid cheap wages to render computer animated fart jokes. Katzenberg political fixer Andy Spahn, a longtime Democratic operative who made his bones on Gary Hart’s presidential campaigns, "insists" to Kroll that "Katzenberg had no discussions with ‘anyone in the Obama administration’ about the Shanghai project, and denies he had any role in the WTO resolution." Of course not: these things just happen. Somehow, though, they all happen to work out for Jeffrey. "Even when show business is on the losing side, Katzenberg knows how to work the angles." Show business lost in 2012 to Silicon Valley, the other province of the Democrats’ California Empire, over the Stop Online Piracy Act, or SOPA, an intellectual property law long sought by Hollywood. The law was shelved when a coalition of Internet activists and tech companies allied against it. Katzenberg and Spielberg may in this instance have been working against fellow Californians such as Mark Zuckerberg of Facebook and Eric Schmidt of Google, but despite their policy differences the West Coast moguls retained their shared sense of cynicism and opportunism. Even as they shipped animator and manufacturing jobs overseas, Katzenberg and the late Steve Jobs of Apple supported politicians who decried outsourcing. Zuckerberg is so eager to import cheap tech labor that he is funding two pro-immigration reform campaigns, one making conservative arguments and the other making liberal ones. Financiers such as Tom Steyer, who build fortunes from government-subsidized green technologies, lambaste money in politics even as they invest in causes and candidates that will help line their friends’ pockets. And a loser like Al Gore, who lives part time in a luxury apartment in the St. Regis Tower in San Francisco, amasses a fortune mouthing environmental platitudes on the board of Silicon Valley companies, only to sell his media company to oil-and-carbon producing sheikhs. No strangers to the hypocrisies and double standards of the political-giving game are they, these California tycoons. "Today’s new autocrats seek not only market control but the right to sell access to our most private details, and employ that technology to elect candidates who will do their bidding," writes Joel Kotkin. A great story here, if America’s scribblers only could put down their iPads and iPhones and Twitter apps long enough to write it. Fifteen years ago, in the Atlantic Monthly, Christopher Caldwell wrote of "The Southern Captivity of the GOP," and described how "the Republicans have narrowly defined ‘values’ as the folkways of one regional subculture, and have urged their imposition on the rest of the country." How different the world looks today, when the regional subculture is that of the sun-dappled coast, and the folkways are progressive shibboleths such as amnesty and environmentalism and social liberalism. The Southern Democrats are long dead, the Midwestern and Rust Belt Democrats are dying, and the New England Puritan Democrats have ceded control of their party to the donors in the West. If President Obama and his party leadership have a problem with the California captivity of the Democratic Party, I cannot detect it. What they should not forget, though, is that California is known not only for its starlets and startups but also for its earthquakes. This entry was posted in Columns and tagged Andy Spahn, Democratic Donors, Hollywood, Jeffrey Katzenberg, Obama Administration, Obama Campaign, Progressive Movement. Bookmark the permalink.